Even though I didn't really enjoy Freakonomics (at least when I first read it), I was instantly hooked on the Freakonomics podcast. There is nothing better than sitting on a train listening to well produced podcasts and just relaxing. And because last spring I had plenty of time to sit on Swiss trains, I also ended up listening to most of the Freakonomics podcasts, new and old. This in turn inspired me to read Superfreakonomics, which despite a name that still turns me off, is a fine work. Perhaps even better than its predecessor. I still consider the podcast to be the best thing that Dubner and Levitt have done, however. For me, the biggest kicks come from the banter between the journalist and the economist, something that is unfortunately absent from the book. 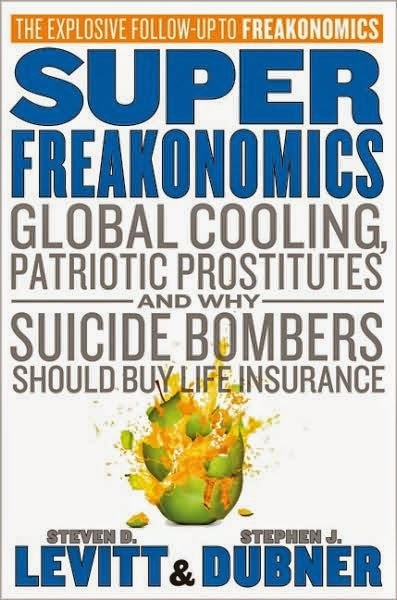 Superfreakonomics is by no means devoid of humor, the punch lines are simply better when voiced in turn by the two authors. I won't be going into the details and stories that make up this work. It continues on the track that Freakonomics set the series on. Therefore, no real surprises to readers of the first entry. And just as before, it really works. I remember Dubner saying in an interview that the book has succeeded if it makes people feel smarter, and that goal has definitely been achieved. Once again, however, I found the radio equivalent to be more memorable and better paced than Superfreakonomics. The podcasts are so well produced that if you put a camera in front of Dubner and his guests, I am pretty sure it could be shown on TV during Friday prime time (in Finland, at least). Superfreakonomics is great, as I already mentioned, but it probably won't induce heated café conversations between equally unknowleadgable soccer moms in the way that books by Malcolm Gladwell might. And perhaps that is a good thing.